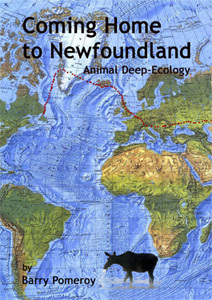 More of an environmental treatise than a talking animal story, Coming Home to Newfoundland is a story of a transplanted moose, long since acclimatized to New Zealand, who decides to make the lengthy and arduous journey home. Along the way she witnesses humanity’s destructive tendencies firsthand and incites revolutionary zeal in nearly everyone who crosses her path. The orangutan in Sumatra, the Aurochs on the Steppes, and many indigenous people along the way are inspired by her unwavering quest and her tale of environmental destruction and activist movements. Behind her she leaves committed activists who begin the laborious process of bringing the earth back to the species who live upon it. The world will never be the same because a moose decided to go home to Newfoundland.